Uintah in Weber County is located at the mouth of Weber Canyon five miles south of Ogden and twenty-five miles north of Salt Lake City. It is bordered by the Weber River on the south and west, by the Uintah Bench on the north, and the Wasatch Mountains on the east. The town occupies approximately three square miles in an area noted for frequent east winds out of Weber Canyon. Long before the first Anglo-Europeans came to Utah, the Uintah area was a favorite camping and hunting ground for Native Americans as they traveled through Weber Canyon. Archeological work has revealed Native American presence dating back at least 5,000 years. In fact, Uintah is named after the Weber Ute Band of Shoshoni Indians which occupied the area at the time of White settlement. The history of the town of Uintah can be described as a series of three population booms. As early as 1850, eight Mormon families located at a point on the Weber River which became known as East Weber. The first settlers were John M. Bybee, Lewis Hardy, Joseph Kingsbury, Daniel Smith, Henry Beckstead, Joseph Hardy, John Windward, and John L. Smith. Lewis Hardy was the leading spirit of the group. In 1850 or early 1851 the Pioneer Canal was constructed and farming operations commenced. By the Spring of 1852 additional settlers had come into the area and it was expected East Weber would develop into a place of some importance. Abaih Wadsworth was appointed to preside over the ecclesiastical affairs of the community. A town was laid out, with the land divided into blocks, lots, and streets running at right angles. The River Ditch (Uintah Central Canal) was constructed and control taken of a small stream known as Spring Creek to bring additional irrigation water. A log school house was erected which served both school and meeting purposes. In 1854 a fort with massive dirt walls was constructed for protection against Indians. It enclosed an area one-fourth mile by 500 feet. This fort served as the center of the community and was used until 1868, when it was torn down for rail road grade fill. Early industries outside of farming and stock raising included the manufacture of charcoal, broom, cane sugar molasses, as well as a small sawmill which cut up logs that floated down the Weber River. No figures are available as to the population of East Weber in the 1850s but early settlers state that the number of men and boys capable of militia training was 300. This indicates a population of 1,000 or more. It was soon discovered that more people had settled in East Weber than could be supported, so the population thinned out to only twenty families. By 1863, land became so cheap that a city lot could be purchased for about fifteen dollars. In 1867, the name of East Weber was changed to Easton by the settlers who remained in the valley. With the coming of the railroad through Weber Canyon, the town of Easton quickly became a wild and wooly boomtown with over 100 businesses and a population over 5,000. A railroad station was constructed in 1869 and was originally called Deseret. The name was soon changed to Uintah, after the local Shoshoni Indians. To avoid the confusion in having a railroad station and post office named Uintah in a town known as Easton, the whole thing was called Uintah. 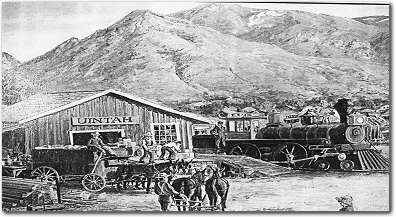 Uintah's second population boom was created by the fact it was the terminus for the freight, mail and passenger traffic headed south mostly for Salt Lake City. Two stage companies vied for control of passenger and mail travel. At the peak of Uintah's boom, about twenty-five saloons lined its main streets, where tough freighters and railroaders enjoyed all of the entertainments of other western boom towns. The town also boasted over seventy-five business establishments: grocery stores, dry goods stores, candy shops, tobacco shops, meat markets, barbers, billiard halls, restaurants, and hotels. The town also had a brewery and Union Pacific Telegraph Office. In 1872, the Utah Central Railroad was opened between Salt Lake City and Ogden, and Uintah's boom period was soon over. Almost overnight residents, business owners, and freighters deserted the town leaving it again to the more sober-minded farmers. Uintah continued to function as an agricultural area. In 1870, a circulating library was established in the schoolhouse, which also served as a social hall and church meeting place. The Uintah Branch of the Mormon Church was reorganized as an LDS ward in 1877, and plans made to construct a church building. The building was finally completed in 1892 at great sacrifice of time and labor to the church members and at a cost of $800. Also in 1899, a new brick schoolhouse was constructed followed by a canning factory built in 1900 to can locally grown fruit and tomatoes. Despite the building activities, Uintah experienced little growth in population. 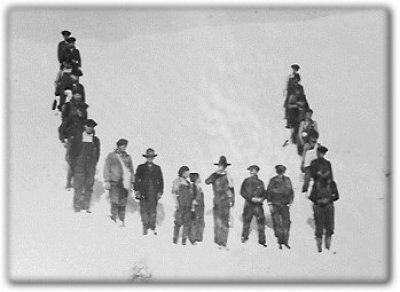 The population of Uintah in 1900 was less than 300 people. A Boy Scout troop was organized in 1923 by Golden Kilburn, a Uintah schoolteacher. The troop's first big project was to build the big block letter "U" which is still a prominent landmark on the mountain east of town. The project turned out to be too much for the Scouts so the townspeople turned out and helped complete the project. It has been a tradition for the town to turn out when school is out in the spring to whitewash the "U." This town celebration is known as "U-Day." The town was still an unincorporated area of Weber County in 1930, but the need for a modern water system was acute, since many of the families were carrying water for culinary use and leaving the irrigation water for other purposes. 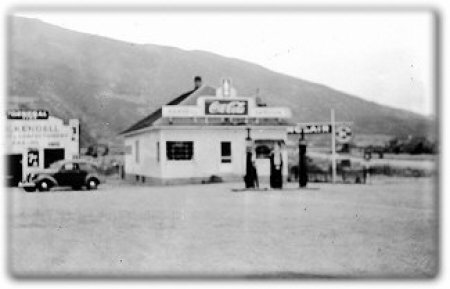 In 1937, the area legally became the town of Uintah. A water system was soon installed at the cost of $20,000. This system was upgraded in 1959. With the improvement of the town water supply, a multi-use park was developed in 1965. The park's ball diamond has seen a lot of use, since baseball and softball have always been favorite sports of the townspeople. A water bond election was held and passed in 1970; this opened the way to enlarge the town water system. Agreements were also signed to add Weber Basin water to the town's system to ensure an adequate supply. With the assurance of an adequate water supply, many improvements were made to the town which has ushered in Uintah's third population boom. The town's effort to remain primarily a rural area currently is having a difficult time because many of the old farms are being broken up. Subdivisions and mobile home parks are rapidly being developed. The population of Uintah has grown from approximately 400 in 1974 to over 1,400 in 1992. The town largely serves as a bedroom community for Ogden and Salt Lake City. At the present time, several family-owned businesses are located in Uintah. The Valley Nursery, Bell Photographers, and Learning Wrap Ups, Inc., are the largest employers in the town. The Valley Nursery has earned the distinction of being one of the largest and best plant and landscaping nurseries in the entire Intermountain West. While Mormons are still predominant, religious diversity is found in Uintah. Two LDS Wards share a new chapel constructed in 1989 and the Combe Road Foursquare Church is located within the town boundaries. Other townspeople attend church services at Protestant and Catholic congregations in near-by communities. For a small place, Uintah has produced its share of illuminaries. Bernado De Voto, the famous American author; the Wattis and Corey Families of internationally known Utah Construction Company; and Art Combe, the "Wizard of the Wasatch" have all called Uintah home. Art Combe, the founder of Valley Nursery earned the nickname for his development of over 100 new plant varieties and his reputation for plant husbandry. George E. Kendell, who for many years ran Kendell's Service at Uintah Junction became one of Northern Utah's most prominent businessmen and millionaires. Uintah has weathered many east winds, a flood in 1952 and two population booms and busts. As the town enters into its third population boom, the prospects for a prosperous future seem bright.